Enjoy the best BBQ Seafood Buffet Bangkok at Cuisine Unplugged offering the fresh selection of the world’s oceans seafood highlights and imported premium barbecue meats for only THB 1,119 net when you book online. Some people travel to visit art galleries and museums. Others want to shop until they drop. Then there are those who just want to relax by the pool. But there’s one thing that every traveler has in common, and it may be the real reason why people love to travel – food! And there is no better way of sampling the finest foods in the world than at a luxury buffet. There’s something about the word ‘buffet’ that brings out the gourmet in us all. Not to mention the sheer bliss of entering a top-class restaurant piled with a vast array of the finest dining choices and being able to sample as many as you would like. We have to thank the people of Sweden for creating the concept; their ‘smorgasbord’ became a popular way of dining in the mid-17th century, where different type of food were laid out for diners to pick and choose. From there, the French perfected this most desirable dining extravaganza into an event that everybody loves, from young to old. 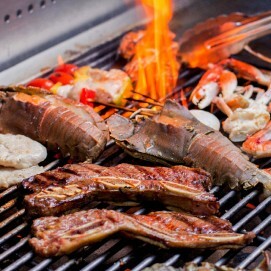 Now, Pullman Bangkok King Power invites you to enjoy the best BBQ Seafood Buffet Bangkok at Cuisine Unplugged. Offering a fresh selection of the world’s seafood highlights as well as imported premium barbecue meats for only THB 1,119 net when you book online. Cuisine Unplugged is simply the best BBQ seafood buffet experience in Bangkok, featuring a cornucopia of flavours that cannot be found elsewhere, so gather all your loved ones and embark on the greatest culinary journey you could ever imagine. 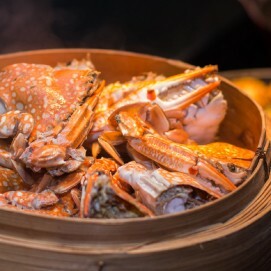 Renowned as the most popular BBQ Seafood Buffet Bangkok, Cuisine Unplugged features an international and seafood buffet dinner 7 days a week, with a truly spectacular selection of fresh and imported produce exquisitely prepared by our expert culinary team. Savour the amazing signature dishes cooked live right in front of you in our open show kitchen from organic and Royal Project ingredients and served fresh to your table. Get your family and friends together and come to try out each delicacy for yourself with the unlimited seafood on ice and premium BBQ meats that will melt right in your mouth. At this spectacular BBQ seafood buffet Bangkok diners can treat their taste buds to superb seafood specialties from around the world, including Alaskan king crabs, brown crabs, blue swimmer crabs, French Fine de Claire oysters, Pacific oysters, New Zealand mussels, spotted babylons, baby lobsters, rock lobsters and red shrimps. A BBQ seafood buffet in Bangkok really could not get any better. 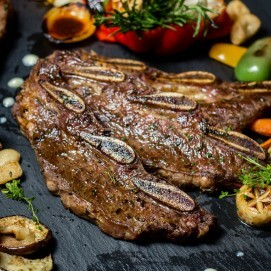 Also, savour the exquisite tastes of premium barbecue meats including USA Asado (Ribeye beef cooked BBQ Latin American style), Australian wagyu beef, Australian tomahawk beef, New Zealand lamb, suckling pig, Kurobuta pork and organic chicken. There is something for everyone at our finest BBQ seafood buffet Bangkok. Our BBQ Seafood Buffet Bangkok also offers an extensive selection of the most well-loved international dishes such as premium sushi and sashimi station, homemade Italian pizza and pasta from live cooking stations, organic salad, truffle soup, cheeses and cold cuts, Thai signature dishes, a host of devilish desserts, roasted meats, noodles, healthy organic salads from the Royal Project and ever-popular Thai signature dishes. Complement this memorable meal with a wide range of enticing seasonal fruits and delectable desserts including macarons, cakes, homemade ice cream and much more. As you walk through the impressive lobby of Pullman Bangkok King Power into the lavish interior of Cuisine Unplugged and find yourself surrounded by the best dishes from the four corners of the globe, you might find yourself forgetting you are in Bangkok. Cuisine Unplugged has an air of casual luxury and ease. Contemporary fittings enhance the restaurants spaciousness, while the lighting give an intimacy and warmth. With its exceptional cuisine, come and discover why foodies consider Cuisine Unplugged one of the best BBQ seafood buffets Bangkok. 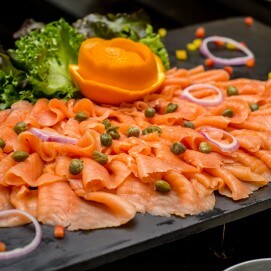 Cuisine Unplugged is located on the ground floor in Pullman Bangkok King Power. It is ideally located in the centre of Bangkok city with easy access for family and friends via the Victory Monument BTS Skytrain station and Airport Rail Link, or guests can reach the hotel by taking the complimentary tuk-tuk shuttle bus provided at Century Mall every 15-minutes. For those who prefer to drive to the hotel, we offer complimentary free car parking when validated after dining at Cuisine Unplugged. After dining you are welcome to take a post-dinner stroll and shop at King Power Duty Free Complex. Located right next to Pullman Bangkok King Power it provides an ultimate shopping experience, with an impressive range of designer brands and beauty products, as well as a breathtaking show of sights and sounds from the 6-meter stunningly choreographed musical fountain, which is synced with captivating classical, pop and specially curated playlists. Don’t wait! Book online now and enjoy our BBQ Seafood Buffet Bangkok together with your family and friends at Cuisine Unplugged from 18.00 – 22.30 hrs.